Tevin Williams surprised everybody last season when he scored 21 goals as a freshman, well almost everybody. “I was a bit rusty last year,” Williams said. “Next season, I am aiming for 30-40 goals. That would be a major success for me.” His confidence is clear, but it was not always this easy for the star out of Westmoreland, Jamaica. His transition to the United States was difficult. He says that it took him a while to find the intensity that he was so used to playing with while in Jamaica. His 2.2 goals per game last season showed otherwise. Williams developed the love for the game while growing up in his homeland. He would be challenged daily by his neighbor, who helped him bring out that attacking mentality. “I developed an aggressive attitude towards the game, because he was way older and I would always have to fight for the ball,” Williams said. He also credits his father Hopeton Williams as an inspiration to him. He was at a tryout in Florida when Coach Devan Anderson made his pitch to come play for Tri-C. “When Coach Devan approached me, the things he was saying, I was like yea, I heard that a million times, but I still had hope.” Williams placed his trust in Coach Anderson and he soon found himself packing his bags and heading to Tri-C.
Williams received 2014 OCCAC First Team honors after his freshman season. He was not the only player who shined on the field last season as Tim McKinney and Coach Devan Anderson won Player of the Year and Coach of the Year, respectively. 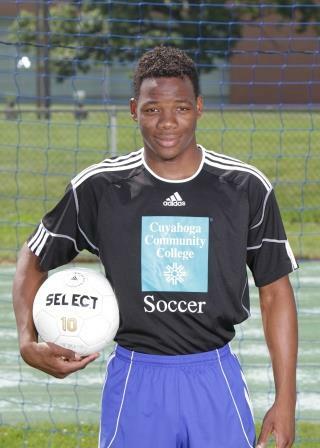 While he longs to be a professional soccer player, Williams takes his education seriously and is looking forward to earning his degree in finance. As one of six returning players, Williams looks to take on more of a leadership role both on and off the field this upcoming season. He has been heavily involved in advertisement ideas and flyers around campus. As for his on-field goals, he looks to help mentor his teammates both new and old and to help lead his team back to the playoffs. After only a few games last season, Williams began grabbing the attention of the conference. That will not be the case in this upcoming season, their eyes are already locked in on his brilliance.